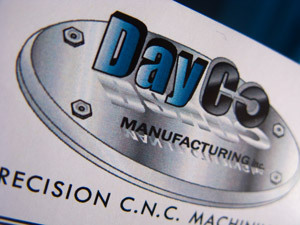 DayCo Manufacturing began operations over 30 years ago in Detroit, Michigan under the name, M.J. Day Machine Tool, Inc. In 2007, the company expanded operations to North Carolina and began operating under the name DayCo Manufacturing, Inc. Through steady growth, Dayco was able to move into its current 15,000 sq. ft. facility in March of 2013. While specializing in aircraft component manufacturing, DayCo is a full service machining source capable of most all manufacturing needs from CNC and manual machining to wire EDM, welding, grinding and fabricating. Over the years, DayCo’s continual quest for quality and customer satisfaction has led to attaining ISO9001, AS- 9100 certification. Not only has this quality system helped in reducing cost and increasing quality, but also gives customers a sense of assurance that their jobs will be completed on time and right the first time. DayCo is proud of the reputation it has earned over the years and always welcomes the opportunity to extend this experience to new customers. DayCo is a full service machining source capable of most all manufacturing needs from CNC and manual machining to wire EDM, welding, grinding and fabricating.